The term American folk music encompasses numerous music genres, variously known as traditional music, traditional folk music, contemporary folk music, or roots music. Many traditional songs have been sung within the same family or folk group for generations, and sometimes trace back to such origins as Great Britain, Europe, or Africa. Musician Mike Seeger once famously commented that the definition of American folk music is "...all the music that fits between the cracks." Roots music is a broad category of music including bluegrass, gospel, old time music, jug bands, Appalachian folk, blues, Cajun and Native American music. The music is considered American either because it is native to the United States or because it developed there, out of foreign origins, to such a degree that it struck musicologists as something distinctly new. It is considered "roots music" because it served as the basis of music later developed in the United States, including rock and roll, rhythm and blues, and jazz. Sea shanties functioned to lighten the burden of routine tasks and provide a rhythm that helped workers perform as a team. Cowboys songs are typically ballads that cowboys sang in the West and Southwest. The familiar Streets of Laredo" (or "Cowboys Lament") derives from an Irish folk song of the late 18th century called "The Unfortunate Rake", which in turn appears to have descended from the even earlier "The Bard of Armagh". While "Streets of Laredo" uses the same melody as "The Unfortunate Rake", "St. James Infirmary Blues" adapts the story to a different tune. This illustrates how folk songs can change in the retelling and appear in a variety of versions. Many roots musicians do not consider themselves folk musicians. The main difference between the American folk music revival and American "roots music" is that roots music seems to cover a broader range, including blues and country. Roots music developed its most expressive and varied forms in the first three decades of the 20th century. The Great Depression and the Dust Bowl were extremely important in disseminating these musical styles to the rest of the country, as Delta blues masters, itinerant honky tonk singers, Cajun musicians spread to cities like Chicago, Los Angeles, and New York. The growth of the recording industry in the same period was also important; higher potential profits from music placed pressure on artists, songwriters, and label executives to replicate previous hit songs. This meant that musical fads, such as Hawaiian slack-key guitar, never died out completely, since a broad range of rhythms, instruments, and vocal stylings were incorporated into disparate popular genres. By the 1950s, forms of roots music had led to pop-oriented forms. Folk musicians like the Kingston Trio, blues-derived rock and roll and rockabilly, pop-gospel, doo wop and R&B (later secularized further as soul music) and the Nashville sound in country music all modernized and expanded the musical palette of the country. Appalachian music is the traditional music of the region of Appalachia in the Eastern United States. It derives from various European and African influences—including English ballads, Irish and Scottish traditional music (especially fiddle music), hymns, and African-American blues. First recorded in the 1920s, Appalachian musicians were a key influence on the early development of Old-time music, country music, and bluegrass, and were an important part of the American folk music revival. Central to the music of the southern Plains Indians is the drum, which has been called the heartbeat of Plains Indian music. Most of that genre traces back to the hunting and warfare that was a strong part of plains culture. During the reservation period, they frequently used music to relieve boredom and despair. Neighbors gathered, exchanged and created songs and dances. This is a part of the roots of the modern intertribal powwow. Another common instrument is the courting flute. Shape-note or sacred harp singing developed in the early nineteenth century as a way for itinerant singing instructors to teach church songs in rural communities. They taught using song books that represented musical notation of tones by geometric shapes that associated a shape with a pitch. Sacred harp singing became popular in many Oklahoma rural communities, regardless of ethnicity. Later, the blues tradition developed, with roots in and parallels to sacred music. By the early 20th century, jazz developed, born from a "blend of ragtime, gospel, and blues" "Anglo-Scots-Irish music traditions gained a place in Oklahoma after the Land Run of 1889. Because of its size and portability, the fiddle was the core of early Oklahoma Anglo music, but other instruments such as the guitar, mandolin, banjo, and steel guitar were added later. Various Oklahoma music traditions trace their roots to the British Isles, including cowboy ballads, western swing, and contemporary country and western." "Mexican immigrants began to reach Oklahoma in the 1870s, bringing beautiful canciones and corridos love songs, waltzes, and ballads along with them. Like American Indian communities, each rite of passage in Hispanic communities is accompanied by traditional music. Genres here range as widely as the definition of folk music itself; working definitions are based on the style and themes of the music regardless of its source. Many are a part of the American Folk Music Revival, including works by Pete Seeger, Woody Guthrie, The Weavers, Burl Ives, and others. 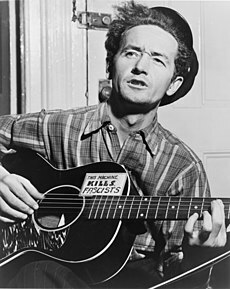 A more commercially oriented pop music version of folk emerged in the 1960s, including performers such as The Kingston Trio, The Limeliters, The Brothers Four, Peter, Paul and Mary, Joan Baez, The Highwaymen, Judy Collins, The New Christy Minstrels, and Gordon Lightfoot, as well as counterculture and folk rock performers including Bob Dylan, The Byrds, Arlo Guthrie, and Buffy Sainte-Marie. Folk composer and musician Robert Schmertz composed and wrote pieces related to historical events in Western Pennsylvania. In 2004, NPR published the book titled The NPR Curious Listener's Guide to American Folk Music, Linda Ronstadt wrote the foreword. In 2007, James P. Leary published Polkabilly: How the Goose Island Ramblers Redefined American Folk Music, which proposes a redefinition of traditional American folk music and identifies a new genre of music from the Upper Midwest known as Polkabilly, which blends ethnic music, old-time country music, and polka. The book was awarded the American Folklore Society’s Chicago Folklore Prize for the best book in the field of folklore scholarship. Hootenanny, a weekly musical variety show broadcast on the ABC network in the U.S. in 1963-1964, primarily featured folk musicians. The soundtrack of the 2000 film O Brother, Where Art Thou? is exclusively roots music, performed by Alison Krauss, The Fairfield Four, Emmylou Harris, Norman Blake and others. In 2001, PBS broadcast a 4-part documentary series, American Roots Music, that explored the historical roots of American roots music through footage and performances by the creators of the movement. The 2003 film A Mighty Wind is a tribute to (and parody of) the folk-pop musicians of the early 1960s. A six-hour public television series, The Music of America: History Through Musical Traditions, appeared in 2010. ^ a b Ted Olson, "Music — Introduction". Encyclopedia of Appalachia (Knoxville, Tenn.: University of Tennessee Press, 2006), pp. 1109—1120. ^ Heatley, Michael (2007). The Definitive Illustrated Encyclopedia of Rock. London, United Kingdom: Star Fire. ISBN 978-1-84451-996-5. ^ a b Gilliland 1969, show 18. ^ Swetnam, George (October 1975). "Historical Society Notes and Documents: Robert Watson Schmertz". The Western Pennsylvania Historical Magazine. 54 (4): 537–538. ^ "Composer, Architect Entertains Avon Club". News Record. October 27–28, 1973. p. 11. ^ "Amazon". The NPR Curious Listener's Guide to American Folk Music, by Kip Lornell (Author), Linda Ronstadt (Foreword). Retrieved May 17, 2007. ^ "Journal of American Folklore: Review", Retrieved 27 April 2013. ^ "Chicago Folklore Prize", Retrieved 27 April 2013. Nettl, Bruno. An Introduction to Folk Music in the United States. Rev. ed. Detroit, Mich.: Wayne State University Press, 1962. The Folk File: A Folkie's Dictionary by Bill Markwick (1945-2017) - musical definitions and short biographies for American and U.K. Folk musicians and groups. Retrieved September 21, 2017.